I’ve been playing around with some spoon carving. Using the Paul Sellers method of creating he bowl with a gouge and then shaping the handle. On some I’ve used a curved scraper to even out the bowl but I kind of like the scallops left by the gouge. These are a lot of fun to do and a great way to use up scraps. Woods are Walnut, Birch, and White Oak. I think they are getting a little better each time. I dig them Mauricio. Nice work man. Nice spoons. 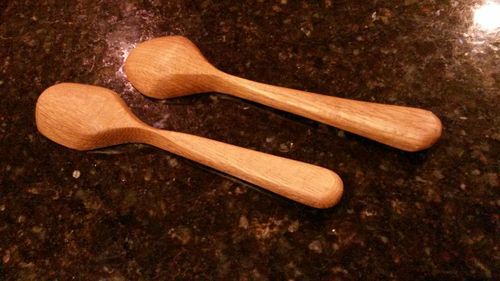 Been thinking of getting into spoon carving too. 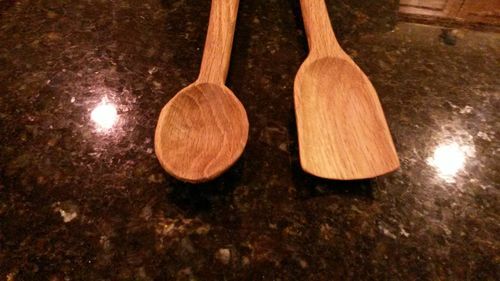 Can’t have to many wooden spoons in the Kitchen. My wife always uses them in her non stick pans. Nice work Mauricio, this is a great way to use up the scraps. Very cool, Mauricio! 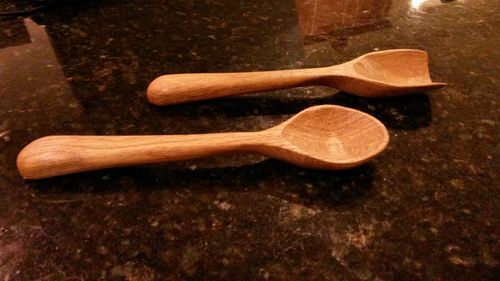 I was carving spoons today, too. Very cool. 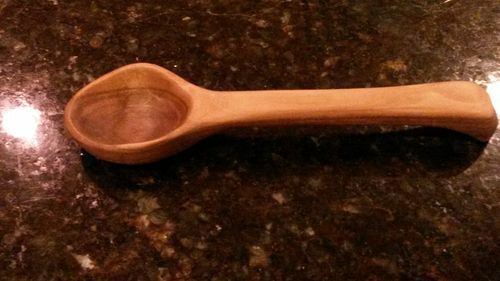 I found carving a spoon to be a lot more fun than I thought it would be. I’ll have to try some green wood next. Nice Mauricio! How big are these? They’re looking very good. I wish I had more time to make some. Sweet, you will never have to do dishes again. Very nice..been wanting to give a go at these..Although im realizing i don’t even own a gouge..Are you using dry wood ? NIce set of spoons, Maur! The flat tipped ones are the best. Thanks for sharing. Lee my wife is on the all natural kick so we got rid of our tephlon and use almost all Cast Iron. You can use anything on cast iron but she loves the wooden spoons. Alex, try it out. Paul sellers has a great blog on how to do it, you just need a gouge and a curved scraper (optional). I don’t have the same gouge he uses, mine is big but much smaller than his, still works well. Terry & Jamie, your right, it is addictive to get the instant gratification of knocking out a project in about 1hr! Brandon, these are just under 10” because that’s just the size of the scraps I had. 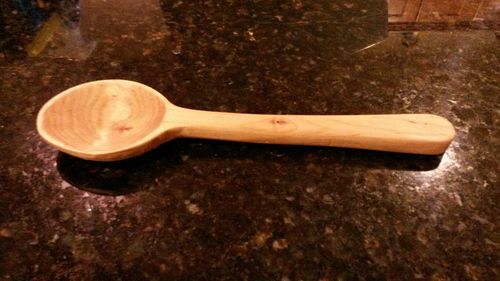 I made a longer spoon that is about 12.5” that I haven’t posted yet. This is a great collection of spoons. Nice work. Really nice spoons Mauricio. Green wood is best when you can get it for cutting and shaping. Keep on having fun with it! All the best.